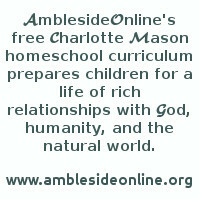 As a help for scheduling Year Three of AmblesideOnline's curriculum, we are pleased to offer printable charts, the weekly assignments in list form below, or families may choose to use a modification of either for their own personal use. However, please see Our Fair Use Policy before sharing any part of the curriculum. This term, focus on explaining and teaching the following geography concept(s): Measuring distance: inch, foot yard; mile. A country's proximity to the equator or poles determines its climate. Parallel lines from pole to pole are longitude. This term, focus on explaining and teaching the following geography concept(s): The sun rises in the east and sets in the west. Pagoo: ch 16 Death Trap! Pagoo: ch 19 Can This Be the End of Pagoo? This term, focus on explaining and teaching the following geography concept(s): A map (plan) is a picture of a room, town, country or earth and should show where N is; how maps are made; maps of towns, regions, countries, the world.